Athlete’s Guide to Recovery (starts at 5:39): Colorado is riddled with athletes, many of them incessantly chasing the latest recovery products and services that will enhance their performance — from Gatorade and other ubiquitous sports-recovery drinks, to supplements, to compression boots, to cryochambers, to good old-fashioned massages. How solid is the solid the science behind the multi-million marketing campaigns? Christie Ashwanden, a former pro cyclist, runner and skier, is also the lead science writer at FiveThirtyEight, and her new book explores the scientific research, the snake oil, and common sense practices, in the world of exercise recovery. 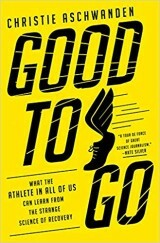 Good to Go: What the Athlete in All of Us Can Learn from the Strange Science of Recovery (Norton), was just published today. Christie will also speak about her book tonight at the Boulder Book Store, and tomorrow in Fort Collins at Old Firehouse Books.